RAPAPORT... The Kimberley Process (KP) Civil Society Coalition hit back against comments by the KP chair criticizing the non-profit alliance for not engaging with the organization. The association last year boycotted the KP when the United Arab Emirates (UAE) was unveiled as its 2016 chairman. The KP has committed to mediation aimed at bringing the coalition back into the frame, Ahmed Bin Sulayem, the UAE-based KP chair, said at the organization’s intersessional in Dubai last month. 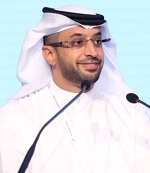 However, Alan Martin, the “self-appointed leader” of the coalition, withdrew from mediation even though the UAE agreed to terms imposed by intermediaries at the World Diamond Council, Bin Sulayem (pictured) claimed in a speech at the conference. The statement was signed by 14 representatives of Amnesty International, Partnership Africa Canada (PAC), the Enough Project, Global Witness and other NGOs, mainly based in Africa. The coalition at times had been forced to make “strong statements and take difficult stands” about “failures” by the KP or its participating states, the statement said. “Such a stand was taken in 2016, resulting in the difficult decision of the KP Civil Society Coalition to remain engaged with the work of the KP but not to support the work of the United Arab Emirates as 2016 chair, in the absence of meaningful engagement and reform by the UAE,” the signatories said. Martin, director of research at PAC, told Rapaport News the coalition presented four key areas in which the UAE needed to act in order for the alliance to reconsider its boycott, but did not receive a response by a deadline earlier this year. The demands, outlined in a document presented by the coalition in January, were addressing the large gap between the value of the country's diamond imports from Africa and their export value; the UAE's alleged lack of "cooperation" on enforcement matters; the "absence" of an "enhanced vigilance system" for diamonds coming from problematic areas; and the need for genuine engagement with civil society.